Riverside Dr & Greenup St. Located in Covington’s Historic Licking Riverside Neighborhood, the tour is comprised of seven life-like bronze statues of historical figures. Chief Little Turtle led a confederation of Miami, Delaware, and Shawnee. Simon Kenton was an early explorer. John James Audubon spent time here drawing and painting. Brought to America as an infant by slave traders, James Bradley earned enough money to purchase his freedom and took part in the Lane Seminary debates on slavery. Daniel Carter Beard founded the Boy Scouts in 1910. Captain Mary B. Greene was one of the few women to become a licensed river pilot and boat master. 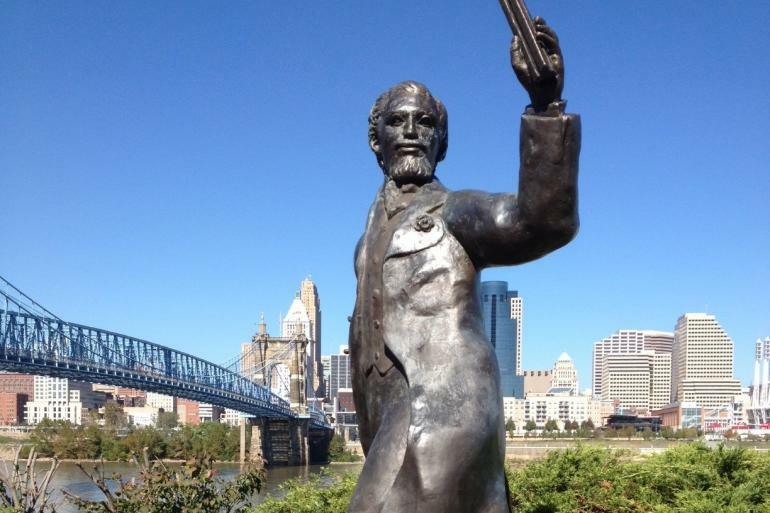 John A. Roebling, best known as the architect of the Brooklyn Bridge, also designed the Roebling Suspension Bridge to connect Kentucky and Ohio. Neapolitan-style pies, sandwiches, and craft brews round out the menu at this minimalist, airy outpost. Offers American fare, a diverse list of bourbons and finely crafted cocktails.